PROPHETIC TRAINING LIKE NO OTHER! Get ready to grow stronger in your prophetic anointing. God is speaking!! We want you to hear what the spirit of the Lord is saying in this season! Prophetic 101 is one of my many programs in my FabLife Prophetic Training Program. It’s 3 days of specific classes- Prophetic Myths, Prophetic Dimensions, & Prophetic Overview. 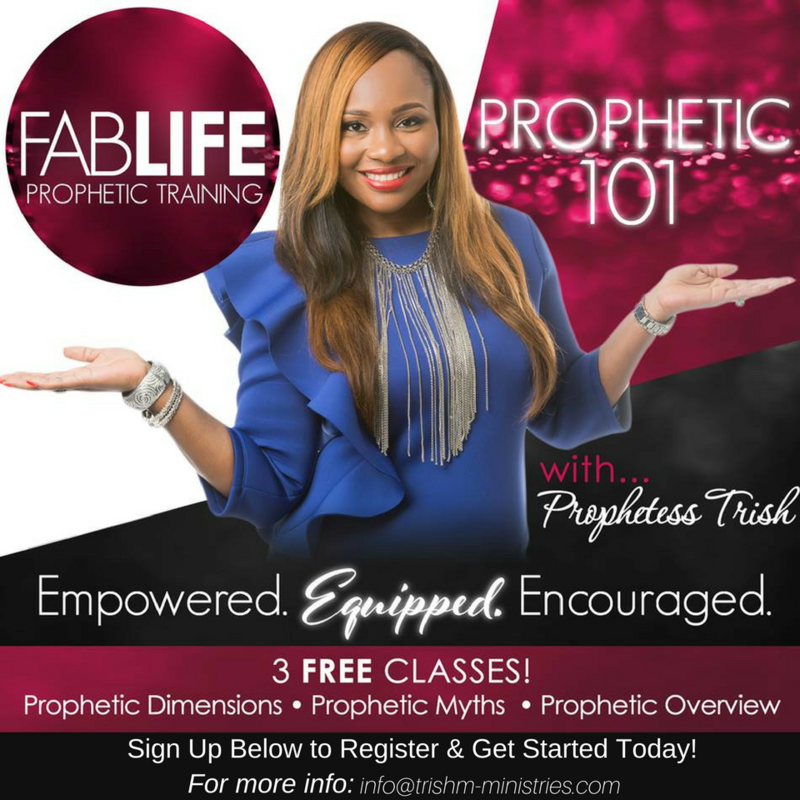 These classes are a pre-launch to my FabLife Prophetic Training Program- The Prophetic Gift Zone- a 12 month mentoring program for all those gifted in the prophetic. I’m giving away 3 FREE classes to give you an idea of how my prophetic program is. I love empowering, equipping, educating and encouraging prophetic voices from all around the world to walk effectively in their prophetic call! If you’ve never taken any of my classes, then today is a GREAT day to get started! So with that being said, let’s walk in purpose together! When God seeks you, let Him find you pursuing destiny and walking in purpose! My 12 month mentoring program is opening. Before you enter the program, take these 3 FREE classes. They’ll bless you! Register TODAY!! So if you are reading this, and you experienced the below, then these class are definitely for YOU! You have prophetic dreams that can sometimes be scary. Experienced what the world calls “Dejavu moments”. God speaks to you prophetically and sometimes you don’t know what to make of what you heard or even saw. Have a keen sense of prophetic discernment. Have had little to no training in the prophetic. Get your FREE training TODAY!!!! No thanks. I want to go to the site.